Year 2006: Carpentry booth with cerved ilighting metacrylate board with fabric to blue and white brightness. low wall constructed like light box. Year 2007: Carpentry booth with LED star brightness in waves roof, wood flooring and rent furniture. Year 2009: Carpentry booth with 3 m high painted walls and two sails in the middle of the wall. The beech wood furniture makes more modern and attractive. Year 2013-15: This booth was made with aluminium profile in rent for great printed fabric. 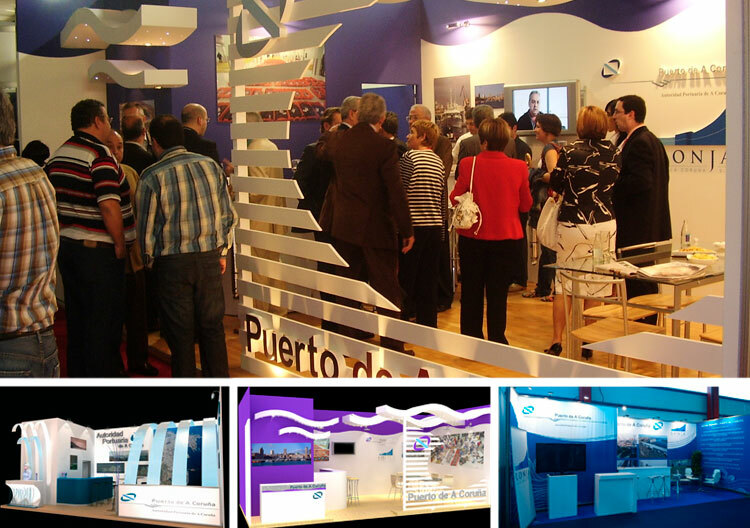 The graphic design emphasizes all the booth, the attractive images was created by our designers. The furniture was in laquered wood and the glass round table with four white design chairs are in rent too. All the booth was well finish, and furthermore economic.